Where are the triceps muscle and what do the triceps do? What exercises can I do to build up the triceps? 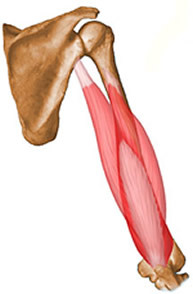 The triceps muscles are on the back of your arm and are called "triceps brachii" in latin. They consist of three groups or "heads" or muscles, hence the name "tri" which means three. The three heads are: long, lateral, and medial. The triceps muscles are responsible for elbow extension, that is, extending your arm out from the elbow in any pressing or pushing movement. The long head crosses the shoulder joint, and two shorter heads attach only onto the arm. The origin for the triceps is on the scapula or shoulder bone and the humerus, and they insert onto the ulna (lower arm). The triceps add a lot of size to your arm (some studies show 2/3 of arm size is triceps) so you should train them just as much as your biceps for good arm size and strength. They also add a lot of tone or muscle definition to the back of the arms and shoulder area, so definitely a good muscle to be training. tricep pushdowns, tricep dips, tricep extensions, tricep kickbacks, narrow push ups, narrow bench press, overhead tricep extension, supine barbell tricep extension. The triceps are also used in bench press, pullovers, push ups (particularly a narrow push up) and shoulder press or overhead movements. Have a look at our page on muscles of the body for more info on muscles of the body. To find out more about triceps, the triceps muscle, or strength training contact us!